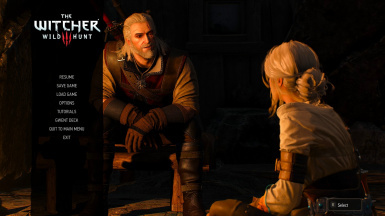 With this mod you can open the menu and pause the game during dialogues and cutscenes. With this mod you can open the menu and pause the game during dialogues and cutscenes, by pressing Escape. You can open the menu during the movies too, but the movies don't get paused. Go to the Witcher 3 folder inside your Documents (My Documents) folder and open the input.settings file with a text editor, such as Notepad. Just below the line that contains the text [Scene] add the this line: IK_Escape=(Action=IngameMenu). If you're using a gamepad you could also add this line: IK_Pad_Back_Select=(Action=IngameMenu) (thanks to mainrouge for pointing this out). As pointed out by sup2069 you may need to place the IK_Escape=(Action=IngameMenu) line under the [SCENE_IS_STARTING_HACK] section too, if the mod is not working. To kkeyy and gorvinsky for raising issues on versions of the mod for game versions I do not own and for providing the necessary files to fix the issues.